In Hinduism, Goddess Annapoorna, or Annapurna Devi, is the Goddess of food. 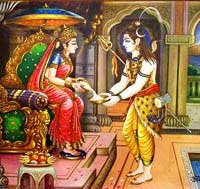 She is an incarnation of Goddess Parvati; in essence one of the numerous forms of Shakti. In this incarnation she nourishes all living beings and therefore Hindus consider ‘Annam’ (food) as holy. 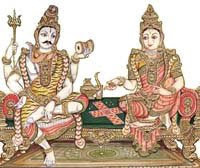 There is an interesting incident involving Lord Shiva and Goddess Annapoorna, which explains that even Moksha (salvation) is not possible on an empty stomach. Gods, humans and demons all kept praying for food. Goddess Parvati could not see her children perishing out hunger and appeared in Kashi (Varanasi) and started distributing food.